A bell tolled 40 times Wednesday, once for each victim of Flight 93, as thousands solemnly gathered in a western Pennsylvania field to remember passengers and crew hailed as heroes for struggling to take back their hijacked plane from four terrorists. The tolling, accompanied by the reading of each victim's name, led up to the moment that the plane crashed at 10:06 a.m. last year. It followed a minute of silence "for world peace" and a fly-over by three military planes. "For all of our loved ones who perished here in Shanksville, we can depart with the gift hope: Hope for our children, hope for our future, and hope for our everlasting freedom," said one of the speakers, Sandy Dahl, the wife of Flight 93 pilot Jason Dahl. "Flight 93 was an extraordinary gathering of individuals. We shall grieve that they died, but we shall rejoice that they lived." 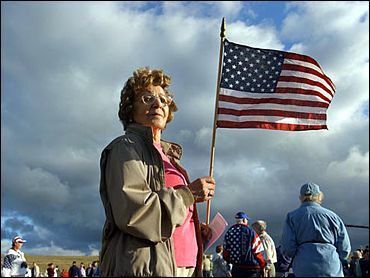 Some 500 family members of the 40 victims of Flight 93 attended, and had a chance to meet President Bush in private when he visited later in the day, after the ceremony. The plane crashed just a half mile from Donna Glester's home, reports CBS News Correspondent Jim Krasula. "I think everyone feels grateful that at this site there was no destruction on the ground," she said. "There are a lot of emotional scars which still remain," said Gov. Mark Schweiker, who arrived early as Secret Service agents and bomb-sniffing dogs swept the site. The ceremony began at 9:30 a.m. with a performance by the Johnstown Symphony Orchestra. More than 500 toured the site privately Tuesday, including Alice Hoglan, whose son Mark Bingham died in the crash Sept. 11, 2001. "It helps me a lot to know it's such a beautiful place," said Hoglan, 52, of Los Gatos, Calif. Flight 93 took off from Newark, N.J., bound for San Francisco. It crashed in a grass field next to a line of trees about 70 miles southeast of Pittsburgh — far from the devastation in New York and at the Pentagon. The reason, say investigators, is that people on board confronted their four hijackers and brought down the flight far from some intended target in Washington, D.C. — The Capitol, according to al Qaeda members interviewed by Arab television recently. A temporary memorial near the crash site has attracted thousands of people — many bringing flags, dolls, photographs and flowers. At 10:06 a.m., the time the plane crashed, a bell was tolled as each victim's name was read aloud. The actual crash site remains enclosed behind a metal fence. Representatives from all but four of the 40 families who lost a loved one in Flight 93 crash had been expected to attend Wednesday's ceremonies. Susan Hankinson, Somerset County's Flight 93 memorial coordinator, said as many as a dozen of the families were making their first visit to the site on Tuesday. She said some — including Lisa Beamer, wife of victim Todd Beamer of Cranbury, N.J., and Deena Burnett, whose husband, Tom, was killed in the crash — chose not to attend for personal reasons.